The Riu Palace Bavaro Hotel is designed to satisfy the needs of all types of guests, as it has more than 600 rooms divided between the main building and the 12 exclusive villas. All of its rooms have free WiFi, a mini-bar with a beverage dispenser, a coffee machine, 24-hour room service, and a balcony or terrace, among numerous other amenities. 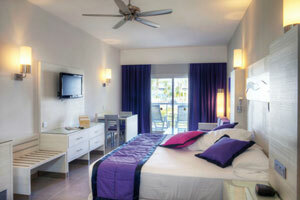 These 41-m2 rooms at the Hotel Riu Palace Bavaro offer you the best amenities for enjoying your stay. In the Garden View Junior Suites, you'll have two small double beds (125x200 cm) or one king-size bed (200x200 cm), a sofa in the lounge area, a hydromassage bathtub, WiFi, satellite TV, air conditioning, a minibar and beverage dispenser, a coffee maker, and a balcony or terrace. 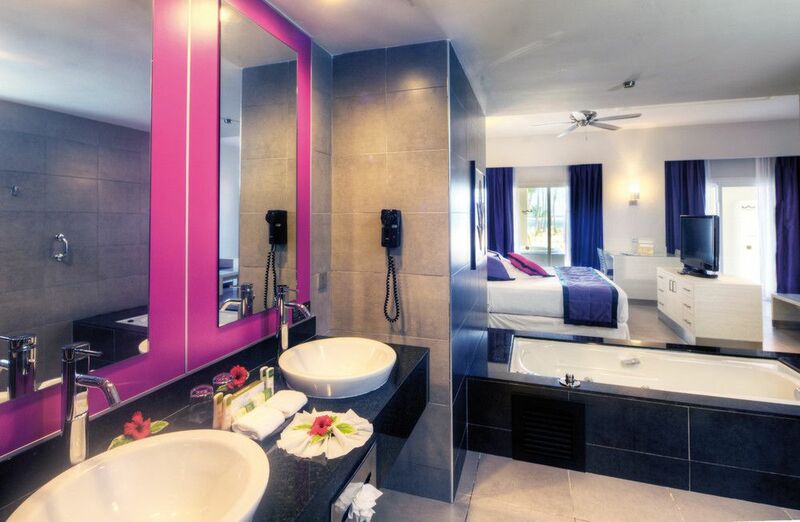 If you want to enjoy a stay with the best services and amenities, the Jacuzzi Suites, located in one of the villas at the Hotel Riu Palace Bavaro, are the perfect option for you. In these 57-m2 rooms, you'll have one king-size bed (200x200 cm), a sofa in the lounge area, a hydromassage bathtub, WiFi, satellite TV, air conditioning, a minibar and beverage dispenser, a coffee maker, and a terrace. And, if you like, you'll find the ultimate in relaxation in the jacuzzi on the terrace. 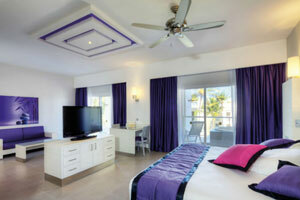 The Hotel Riu Palace Bavaro has several individual villas where you'll find the Jacuzzi Superior Junior Suites. These 41-m2 rooms, are equipped with one king-size bed (200x200 cm), a sofa in the lounge area, a hydromassage bathtub, WiFi, satellite TV, air conditioning, a minibar and beverage dispenser, and a coffee maker. Plus, on the terrace, you'll find a jacuzzi for the ultimate in relaxation. 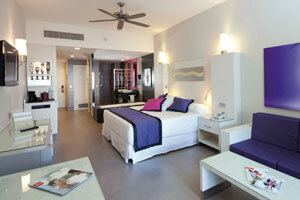 These 41-m2 rooms offer you the best amenities for enjoying your escape to the utmost. 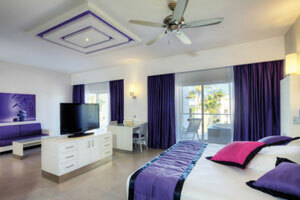 The Sea View Junior Suites at the Hotel Riu Palace Bavaro are located in a separate villa and have two small double beds (125x200 cm) or one king-size bed (200x200 cm), a sofa in the lounge area, a hydromassage bathtub, WiFi, satellite TV, air conditioning, a minibar and beverage dispenser, and a coffee maker. Plus, from the balcony or terrace, you'll have incredible views of the sea. 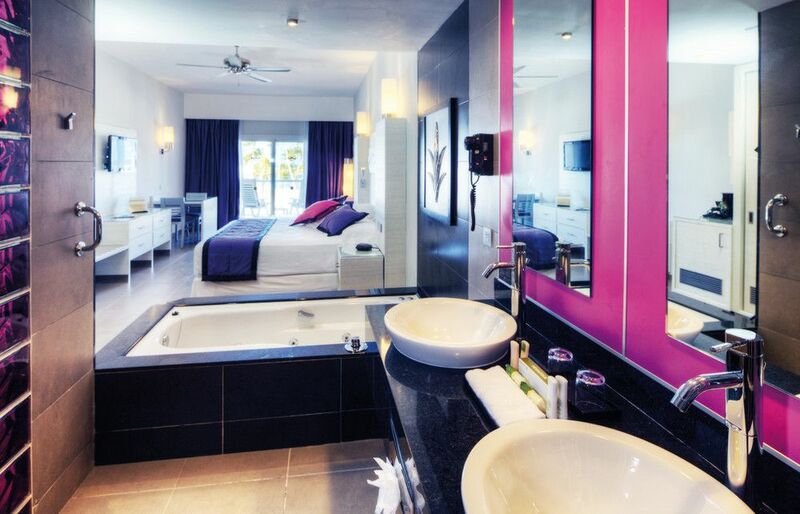 The Jacuzzi Suites at the Hotel Riu Palace Bavaro are the perfect accommodations for those seeking a luxury holiday in Punta Cana. In these 64-m2 rooms, you'll have one king-size bed (200x200 cm), a sofa in the lounge area, a hydromassage bathtub, WiFi, satellite TV, air conditioning, a minibar and beverage dispenser, and a coffee maker. Plus, in the jacuzzi on the terrace, you'll find the ultimate in relaxation. 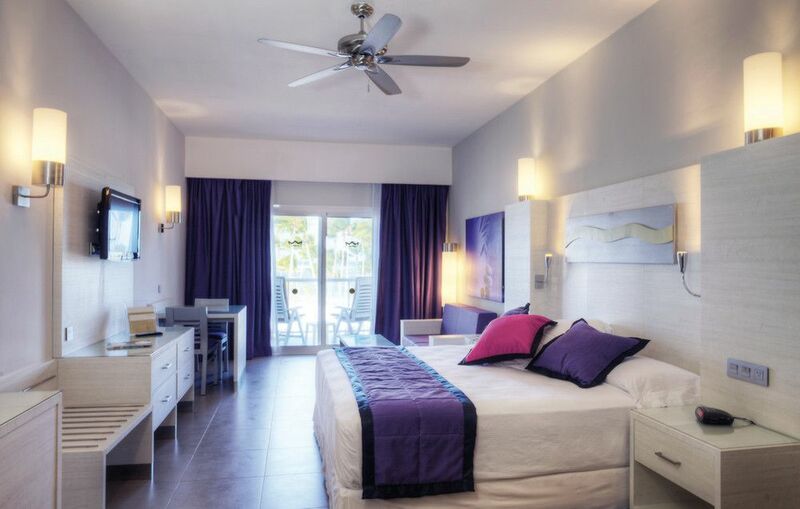 The Pool View Junior Suites are located in one of the villas of the Hotel Riu Palace Bavaro and they're perfectly equipped to offer you the best amenities. In these 41-m2 rooms, you'll find two small double beds (125x200 cm) or one king-size bed (200x200 cm), a sofa in the lounge area, a hydromassage bathtub, WiFi, satellite TV, air conditioning, a minibar and beverage dispenser, a coffee maker, and a balcony or terrace. 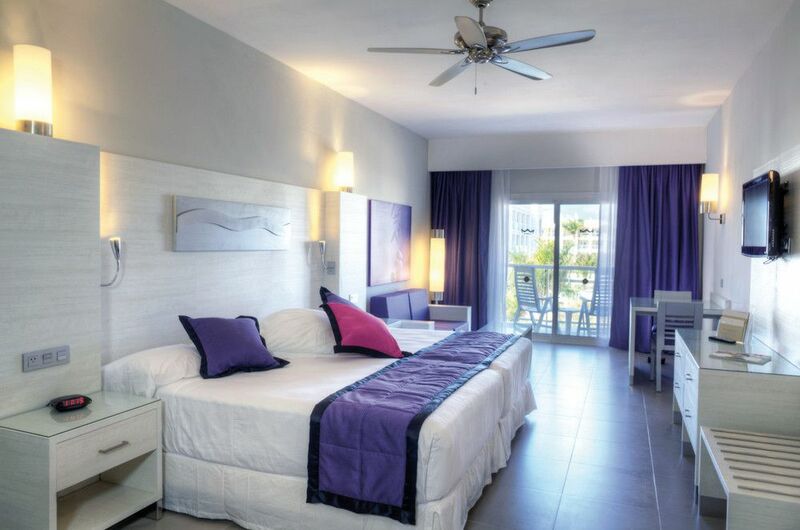 The Garden View Superior Junior Suites at the Hotel Riu Palace Bavaro are perfectly equipped to offer you everything you need on your holiday. These 41-m2 rooms have two small double beds (125x200 cm) or one king-size bed (200x200 cm), a sofa in the lounge area, a hydromassage bathtub, WiFi, satellite TV, air conditioning, a minibar and beverage dispenser, a coffee maker, and a balcony or terrace with views of the hotel gardens. 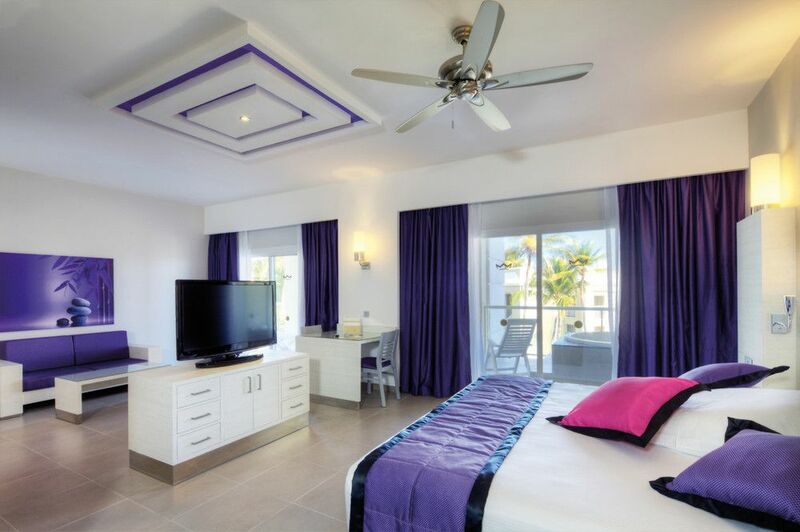 In the Grand Terrace Junior Suites at the Hotel Riu Palace Bavaro, you'll find all the amenities for enjoying an unforgettable holiday. These 41-m2 rooms have two small double beds (125x200 cm) or one king-size bed (200x200 cm), a sofa in the lounge area, a hydromassage bathtub, WiFi, satellite TV, air conditioning, a minibar and beverage dispenser, a coffee maker, and a terrace.